There were a lot of debates about the game sharing on the next generation of consoles, but no one could even suppose that the same thing may be offered for digital versions of the games. But today NeoGAF user has published several interesting strings that were found in the latest beta version of the Steam client. And they are "talking" about the opportunity to share used games! The strings represent the text files with very interesting phrases. Thus, one of them looks like the title - "Shared game library", and two others may be messages: "Just so you know, your games are currently in use by %borrower%. Playing now will send %borrower% a notice that it's time to quit" and "This shared game is currently unavailable. Please try again later or buy this game for your own library". According to these lines, the opportunity to share used games may appear on Steam in the next version of its client, and this news sounds really great. 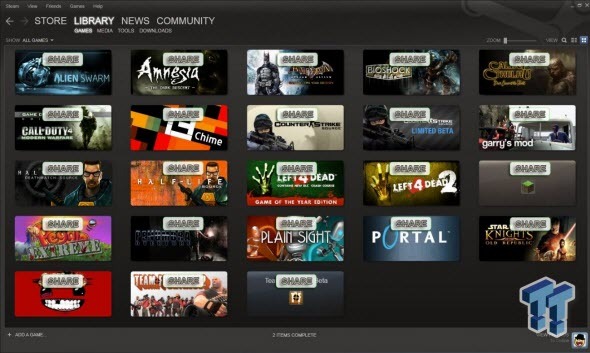 Valve hasn't confirmed anything about the shared game library and has announced nothing like this yet, but we are sure that this news is coming very soon. Follow GameSpace to be the first to know.